This baby is just yawning. Welcome to Knocked Up Abroad Travels, a parent-friendly guide to travel. While there is no shortage of mommy blogs, travel blogs, or even mommy travel blogs on the internet, I wanted to create a site for people who were travelers before they were parents, who want to travel beyond Disney and grandparents, or who have children abroad. Beyond travel, this blog is for parents who’ve taken their baby to happy hour and watched them snooze under the table. It’s for children who are more at home on a subway train than in a minivan. It’s for people who believe in the five-second rule over sanitizing everything. This site is a continuation and expansion of the Knocked Up Abroad column I started last year on Gadling, chronicling my experience as a pregnant expat in Istanbul and traveling with a baby. Getting around: Not all cities are stroller-friendly (ahem, Venice), but we’ve lugged our Bugaboo Cameleon to eight countries along with a carrier (or two). I’ll report on my travails hauling strollers up subway steps and over cobblestones, sweating with a 10-pound baby strapped to me, and hanging on for dear life in Istanbul taxis. Dining/drinking out: In Istanbul, babies are so adored I could take Vera to a nightclub and be happily welcomed, but not all people are as baby-crazy as the Turks. Find out what’s it like to breastfeed in a beer garden or try to eat lunch alone with a wriggly baby when neither of you recognize anything on the menu. Shopping and souvenirs: We generally travel with just enough diapers to get us to the first morning in a new place, simple outfits that can be laundered and re-worn, and only toys that can be carried in a pocket or handbag. We often leave a place with some cool gear we can’t get at home and a souvenir or two that V can enjoy as she gets bigger. Planning resources: For each place and baby stage of travel, I do a lot of research. Like, days and days of web-searching, note-taking, and accommodation comparison. I often go overboard, but it helps to know what you’re getting into, and I’m happy to share my favorite travel, parenting, and sometimes random sites for planning a trip with a baby. Get started here. Out and about: Istanbul has taught be to be resourceful when changing diapers in absence of a changing table, so the massive baby rooms (complete with vending machines) in London’s department stores were nearly overwhelming. In Budapest, I found the ominous-sounding House of Terror perfect for visiting before Vera is old enough to demand explanations. I’ll include these types of dribs and drabs that might prove useful or entertaining. I’ll also write about traveling while you’re still expecting, reviews some of our favorite baby travel gear, news and opinions on issues affecting travel with a baby, and more info on living abroad. If you want more info on me or want to contact us, go here. That about covers it for now, welcome aboard! And if you hear a crying baby on your next flight, it’s probably not us. Tebrikler, Meg! Way to get the blog started. 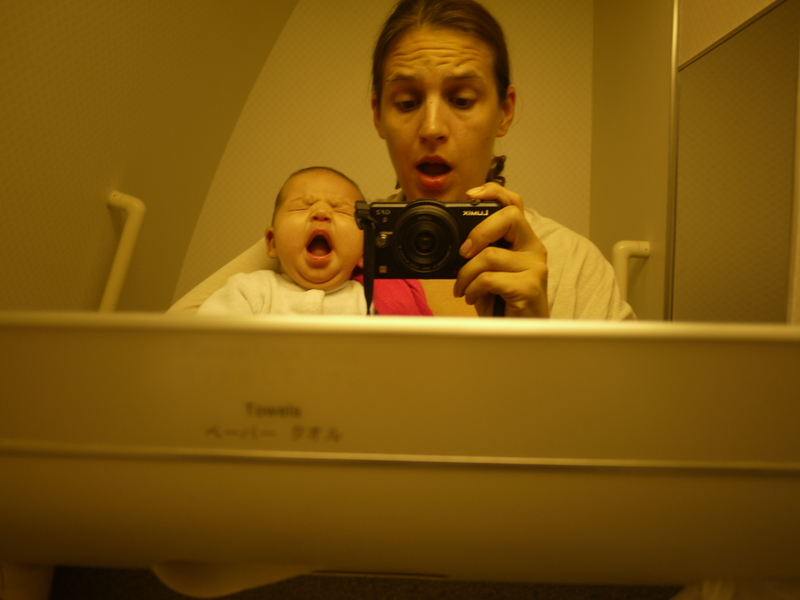 I’m sure it will be a great resource to other moms – you definitely have the baby travel experience down pat! Thanks Joy! We’ll have to have our own little launch party soon! Looks wonderful! You’ve launched this just in time for Vera’s visit to Athens. Good show!! Gear: What makes a good travel stroller? Before Baby Turns Two: Where to Go?